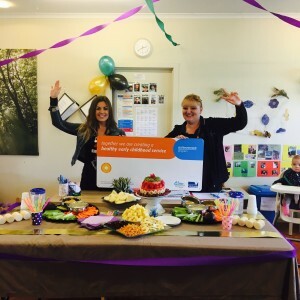 Rowville Children and Family Centre have officially been recognised as a Health Promoting Service as part of the Victorian Government’s Achievement Program for all their hard work around Health Eating and Oral Health, as well as Sun Protection. The Achievement Program encourages workplaces, schools and early years services to create healthier environments. Rowville Children and Family Centre have been working with our Health Promotion team since the Achievement Program was first piloted in 2012, using the Program as a framework to create a healthy environment and promote the health and wellbeing of the whole service community. The Centre had their menu assessed by the Healthy Eating Advisory Service to ensure it meets the recommended Australian Dietary Guidelines for Healthy Eating. In order to pass these set of guidelines, Michelle Males, Centre Cook attended numerous ‘Cooks Networks’ hosted by our Health Promotion Officer, Catherine Delaney to assist her in making the appropriate changes to their menu. Catherine Delaney presented the Centre with their Achievement Program outdoor sign to highlight their success in promoting the consumption of fruit and vegetables through their physical and social environment. 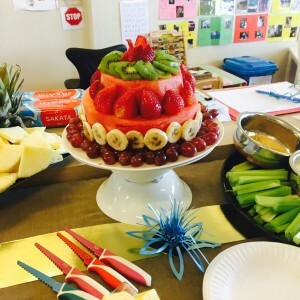 Michelle Males, Centre Cook is very passionate about healthy eating and created a very colourful and decorative watermelon cake especially for this event. “As the Centre Cook, I’m so proud to be part of the Achievement program. Children and Staff now reach for a healthy alternative and staff enjoy going for walks on their breaks. Our lives have changed for the better, and I can see the change in the children that I hope will stay with them for life. 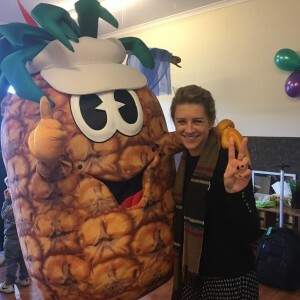 As for our very special team member Penny Pineapple, she takes great delight in seeing the Children enjoy fresh fruit as an alternative to sugar based snacks and made a special appearance to celebrate our wonderful achievement. Many thanks to Catherine from EACH for her ongoing support, it is very much appreciated,” said Michelle Males, Centre Cook. The Centre ensures that all the foods provided at their staff meetings include healthy options only to encourage staff to adopt healthier eating habits. Keep up the great work Rowville Children and Family Centre! For more information on this initiative or how your workplace can improve the health and wellbeing of staff and management, please contact Catherine Delaney, Health Promotion Officer on (03) 9757 6278 .